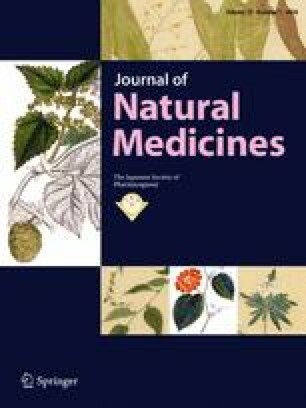 As part of our continuing study of ephedrine alkaloids-free Ephedra Herb extract (EFE) in pursuit of its approval as a crude drug preparation, we identified two quantitative markers for the quality control of the manufacturing process of EFE and sought to establish cost-effective and simple methods for quantitative analyses. We analysed Ephedra Herb extracts grown in different habitats and collection years by liquid chromatography/high-resolution mass spectrometry (LC/HRMS) and detected two notable peaks common to each extract. These peaks were identified as vicenin-2 (1) and isovitexin 2″-O-rhamnoside (2). Quantitative analyses using the isocratic condition of LC/MS showed that the content percentages of 1 and 2 in EFE were 0.140–0.146% and 0.350–0.411%, respectively. We concluded that 1 and 2 were adequate quality control markers for quantitative analysis of EFE. Furthermore, we quantitatively analysed apigenin (3), an aglycon common to 1 and 2, and found that the conversion factors of 1 to 3 and 2 to 3 were 1.3 and 1.5, respectively. Therefore, we concluded that 3 was a secondary standard for quantifying the contents of 1 and 2 in EFE. A series of results obtained from this study will be valuable for the quality control of EFE. The online version of this article (doi: 10.1007/s11418-017-1111-8) contains supplementary material, which is available to authorized users. This research is partially supported by the Research and Development of New Drugs project of the Japan Agency for Medical Research and Development (AMED). We have applied for a patent under the regulation of the Patent Cooperation Treaty (PCT).